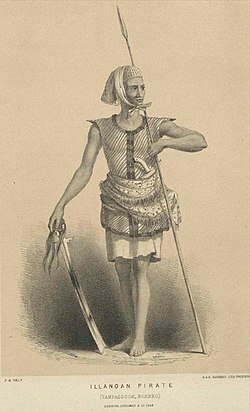 A 19th century illustration of an Iranun pirate. The Iranun are a Moro ethnic group native to Mindanao, Philippines, and the west coast of Sabah (in which they are found in 25 villages around the Kota Belud and Lahad Datu districts; also in Kudat and Likas, Kota Kinabalu). The rehabilitation of a traditional Iranun house in the Heritage Village of Kota Kinabalu, Sabah. For centuries, the Iranun were involved in pirate-related occupations in the Malay world. Lanun means pirate in Malay language. Originally from the Sultanate of Maguindanao, in southern Mindanao, Iranun colonies spread throughout Mindanao, the Sulu Archipelago and the north and east coast of Borneo. Most Iranuns are Muslim. Their language is part of the Austronesian family, and is most closely related to the Maranao people of Lanao. Historically, the Iranun were given the exonym Illanun during the British colonial era. The Malay term Lanun or pirate originated from the exonym. In the case of inter-marriages of an Iranun woman and an outsider man, the cultural influences of the woman's family will be more dominant that the outsider man would be considered as an Iranun man; although in a lot cases this does not happen. The language of the Maranao and Maguindanao is strongly rooted in the Iranun tongue. The Iranun may perhaps be the mother language and the rest are just a mere dialects. For several centuries, the Iranuns in the Philippines formed part of the Sultanate of Maguindanao. In the past, the seat of the Maguindanao Sultanate was situated at Lamitan and Malabang. Both of which were the strongholds of the Iranun society. Iranuns fought the Western invaders under the flag of the Maguindanao Sultanate. They formed part of the Moro resistance against the USA occupation of the Philippines from 1899 to 1913. The Iranun were excellent in maritime activity as they are traditionally sailors and pirates. They used to ply the route connecting the Sulu Sea, Moro Gulf to Celebes Sea, and raided the Spanish held territories along the way. ^ Bandira Datu Alang (1992). Iranun: sejarah dan adat tradisi. Dewan Bahasa dan Pustaka, Kementerian Pendidikan Malaysia. p. 80. ISBN 98-362-2600-1. ^ a b Kenneth Hite & Kennon Bauman (2016). The Cthulhu Wars: The United States’ Battles Against the Mythos. Bloomsbury Publishing. ISBN 14-728-0789-8. Wikimedia Commons has media related to Moro.